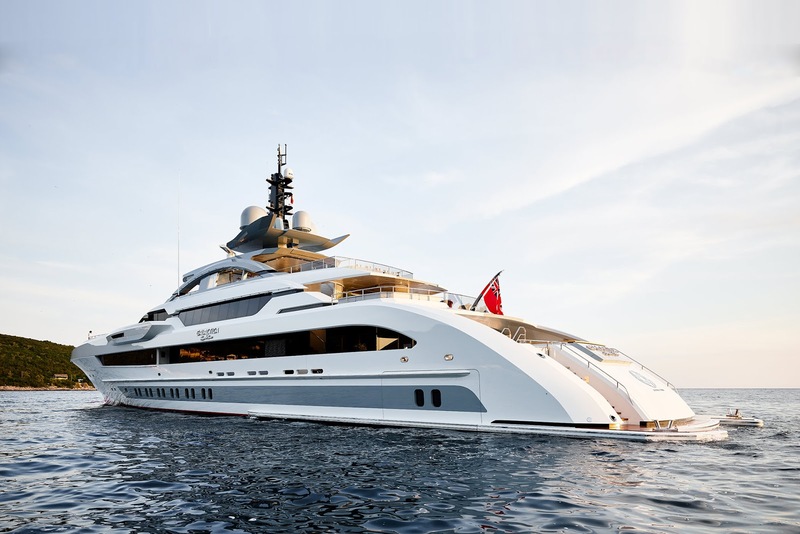 Galactica Supernova yacht was built in Holland, by Heesen Yachts, renowned for its craftsmanship concerning exceptional vessels. In this country, each yacht is known for its innovations and unique design, like the one we are presenting today. Galactica Supernova yacht is both long, fast and comfortable. 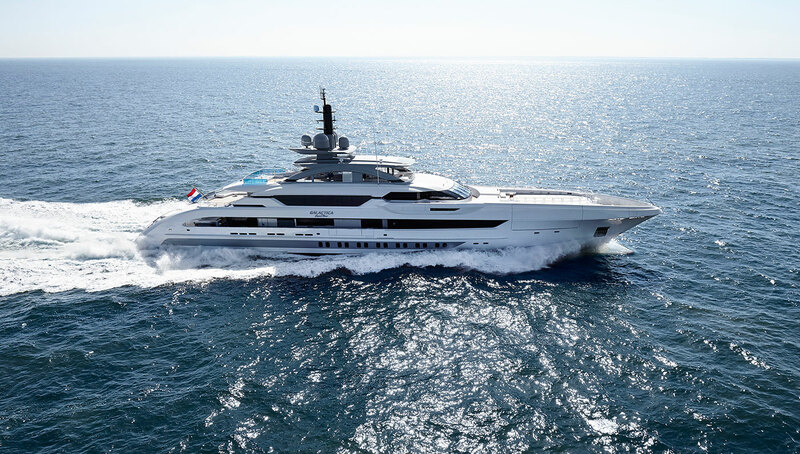 Made with steel and aluminium, this 70m-long vessel is Heesen’s longer yacht. But its length doesn’t does not interfere with its rapidity because Galactica Supernova yacht can achieve 30 knots which made Galactica the fastest aluminium vessel in its range. Moreover, the boat keeps low fuel consumption during above 4000 nautical knots. 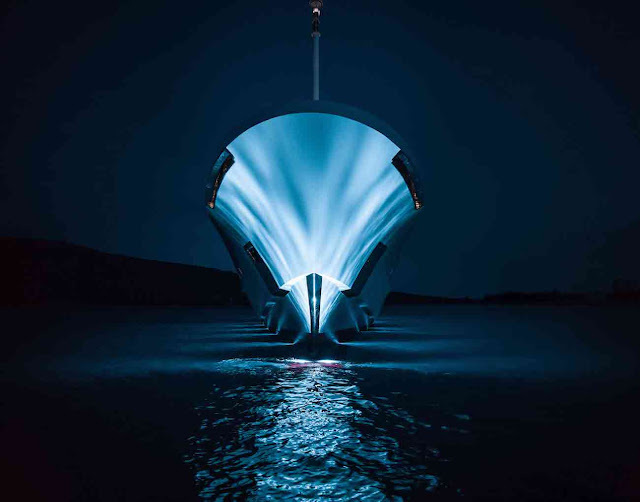 This greater speed and fuel consumption is possible thanks to its hull and Rolls Royce central booster. In addition to its numerous performances, Galactica Supernova yacht remains silent and totally safe regardless to weather conditions. All these new materials don’t taint Galactica Supernova yacht ’s comfort and luxury. Its decks are absolutely sumptuous all around the vessel, arranged with bars, sofas and bespoke chairs. 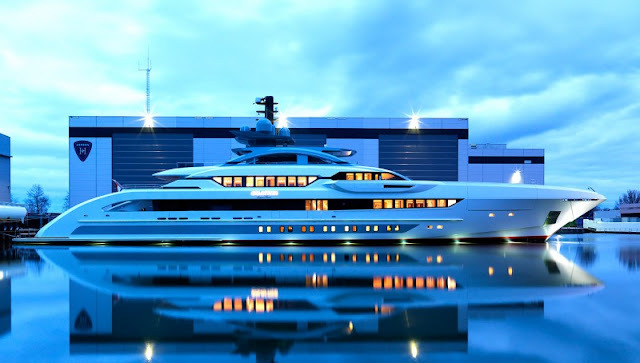 You can access the decks through large glass doors that allow you to walk freely from inside to the fore and aft decks. 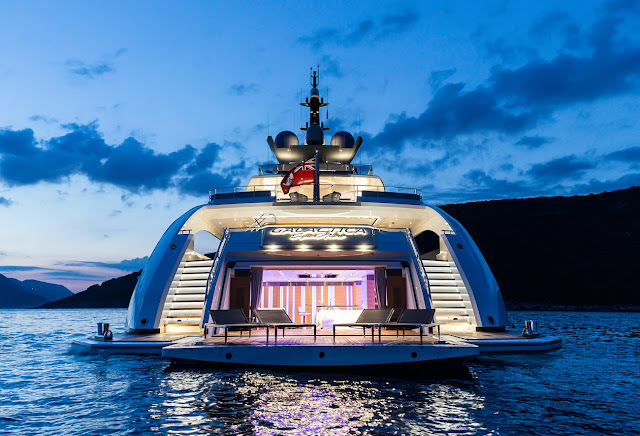 Then, Galactica Supernova yacht’s decks also possess an helipad and can be transformed into open-air cinema with a 2.25m high HD screen, and they also accommodate a 6m-long pool with waterfalls. At nightfall, LED lighting system enchants all passengers until sunset. Galactica Supernova yacht also has its own beach club, with lounge space and exterior bars to rest with all necessary comfort when the vessel is anchored. It can be transformed into a nightclub at night, but is also the ideal place for a romantic dinner or a friendly reception. And your guests won’t believe their eyes once inside Galactica Supernova yacht. Everything here is bespoke and handcrafted. 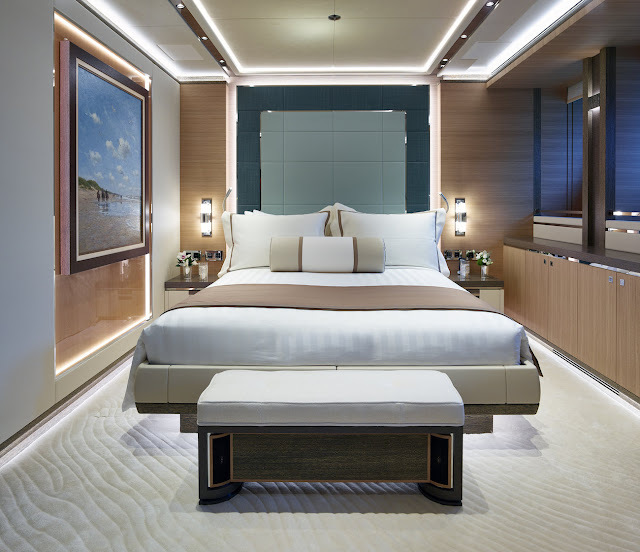 The inside spaces are truly contemporary and focused on all passengers’ comfort. Living room, as an example, can be divided in three parts: a speaking area with café tables, a semi-circular library with a fireplace and a spacious dining room that can accommodate up to 12 guests. Concerning the suites in Galactica Supernova yacht, the owner suite is a true splendour with floor-to-ceiling onyx walls. 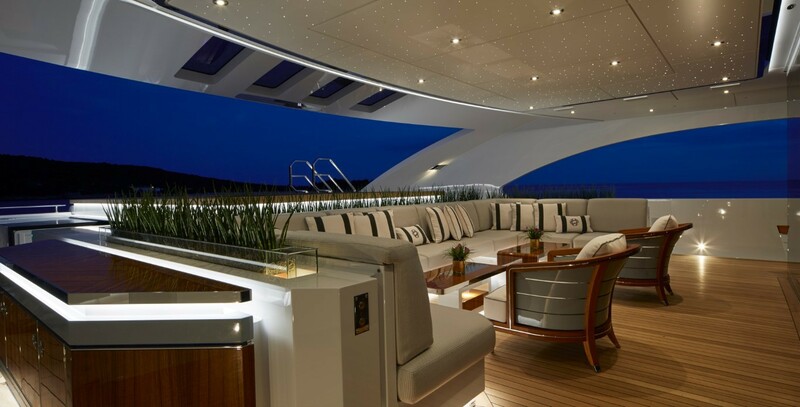 Moreover, this is a truly intimate space that can only be accessible passing by the owner’s private deck. totally forbidden to other guests…if you desire so. Concerning guests, they can stay in two double rooms or two twin rooms, located at the lower deck, each with their own en-suite marble bathrooms. 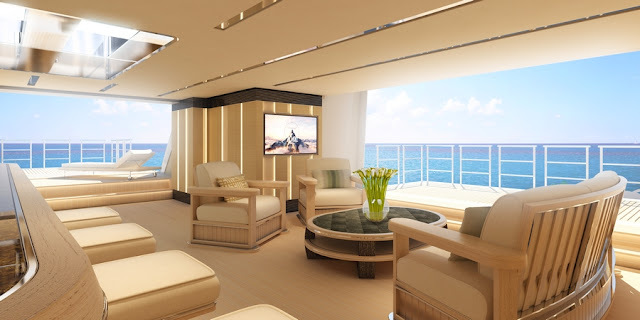 Concerning the other rooms on Galactica Supernova yacht, they are all unique and modern, as well as impressive; particularly the designed staircases and elevator, as well as the staff warm space and the huge five-stars kitchen. All is made to impress your guests! So this one is a true idyllic vessel to navigate on the biggest oceans!